Would you like to make a difference for our environment and save money on your transportation as well? 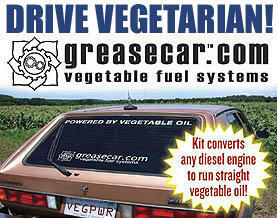 Consider this - fuel your car with vegetable oil! Sound impossible? I was surprised to learn that you can convert almost any diesel car, truck, SUV or RV to run on used (or pure) vegetable oil (which you can most likely get for free from local restaurants since they have to pay to have it disposed) for under $1,000. Read more about Grease Cars. All the best for your health (and driving)! Those that eat legumes live longest reports a study by the National Aging Research Institute in Melbourne, Australia. "There is a 7% - 8% reduction in mortality hazard ratio for every 20g increase in daily legume intake"
The study showed that legume consumption is the most protective dietary predictor of survival regardless of their ethnicity. Legumes have long been associated with good health, and are a staple among vegetarians and vegans. Legumes include soy, tofu, natto, miso, brown beans, peas, lentils, chickpeas, white beans among others. Read more of the study at PubMed. Where To Buy Organic, Vegan? Posted on May 7th, 2005 in Uncategorized by Vegan Raw Diet Advocate Comments Off on Where To Buy Organic, Vegan? I'm often asked... where do you buy healthy, organic, vegan food? That's a good question, because many people aren't familiar with the growing number of stores, both online and off that offer a large selection. Stores in most cities throughout US. Not everything is organic or vegan, but they carry an excellent selection. Has better vegan baked goods selection than most others. Stores in most cities throughout the US. Not everything is organic or vegan, but they carry an excellent selection. Stores in many cities, expanding quickly. Need to look closely at labels, not all products are healthy, but they carry many healthy brand lines and low prices. Large selection of raw/living foods, beauty, supplements, books, videos, events and appliances. Run by well known raw food advocate, author and speaker David Wolfe. Has low price guarantee. Staff is mostly raw. Offers large selection of raw, vegan and organic foods, cooking supplies, personal care, and supplements. Staff is mostly raw. Large selection of organic foods and sweets, vegan, raw foods, health and beauty, food bars and home and garden. Well priced, excellent customer service. Large selection of vegan foods, snacks, clothes, personal care, accessories, supplements and more. Top rated veggie store with large selection of foods, clothes, personal care, gifts, accessories, pet and related products. Let me know if you have others to add, along with your experiences. » Comments Comments Off on Where To Buy Organic, Vegan?